Visitor Signs reduce visitor confusion, make them feel comfortable and give them the instructions that they need while visiting your facility. Visitor Signs are ideal for mounting on loading docks, in parking lots and in lobbies. Visitor Signs are available in a variety of materials to suit your particular environment, both indoors and out. Most businesses will have visitors in and out of their facility at various times. 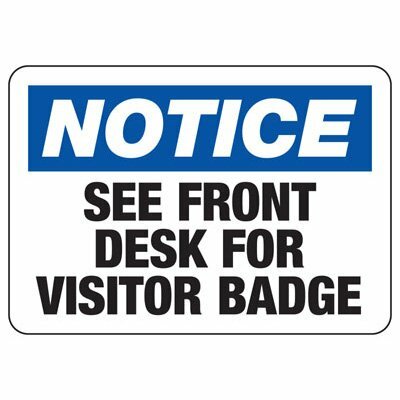 Visitor Signs are a great way to provide your visitors with directions on where to park, where to report, what credentials they need to show, etc. Visitor Signs come in various sizes, styles, colors and messaging. Be sure to choose the right visitor sign for your particular needs. Check out Seton's large variety, including Check With Guard, Emergency Exit Only This Door is Alarmed, Register At Office, Report To Reception, Metal Dectector Screening Required Before Entering Facility, See-Thru Security Decals - All Visitors and more. You can also choose a semi-custom visitor sign in various styles and sizes for more specific messaging option.